I think 4 days may be my limit travelling alone. The excitement wears off and places where the plan goes awry piles up. Tedium and lethargy always set in around this time. 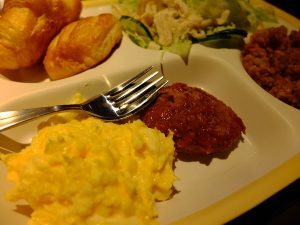 The breakfast at Villa Fountaine had changed a little, the sausage became a meat patty and the fried rice became curry flavoured fried rice. Taste about the same. 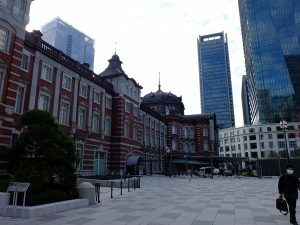 After breakfast and checkout since it was still early, I decided to head to the area in front of Tokyo station for a walk. 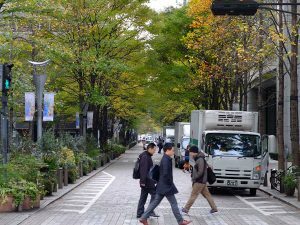 Some of the ginkyo trees in the open had already yellowed or fallen while ones in the Marunouchi were still mostly green. The autumn leaves was very uneven this year, likely a result of the swings in weather. In retrospect I should have gone to Meiji Jingu Outer Garden since I knew it would rain tomorrow morning. I could have at least done a full walk to Yurakucho, it would have delayed going to the exhibition but there was time. The brain had mostly shutdown though and I just went numbly through the schedule for most of the day. Nogizaka station connected directly with the art museum. Similar to Roppongi station the line was built very deep beneath the ground and it took at least 5 flight of escalators to get to the entrance. Excitement floods back into me once I was handed the beautifully printed ticket. 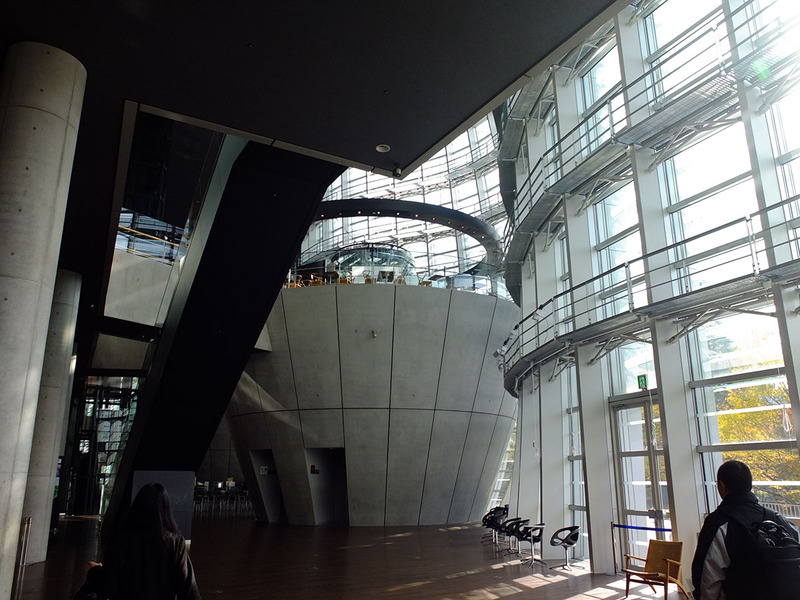 The art museum’s outward facing side was a wavey lattice of glass wall. 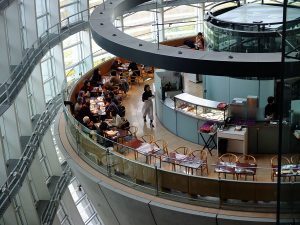 The inside was an empty space occupied by two upside down cones where upon sat a cafe and a restaurant. This is where Taki and Okudera had their date. A line was beginning to form outside the exhibit entrance. I rushed to go in before I could get a better look of the art gallery. Sadly there is no taking photo inside exhibit. In addition to the ticket I also got the audio guide (always get audio guides). The Japanese audio guide is voiced by none other than Kamiki Ryunosuke, Taki’s voice actor and long time big fan of Shinkai, and every section had a track where Kamiki would describe his own experience and thoughts toward the particular piece of work. Since this is a huge selling point, the English guide would leave in Kamiki’s Japanese voice for a sentence or two before fading out and the English voice takes over. The English voice also did its best to mimic Kamiki’s soothing, cute, calm, dreamy mannerism. At first the line to around the exhibit moved very slowly as everyone took their time to go through the sketches, storyboards or magazine articles. A few would meticulously note down things in their notebook and one person I noticed would even sketch down the storyboards. While waiting for the lines to move I also wrote down the more notable features of the exhibit on the phone. While each of Shinkai’s film would have a dedicated section, they would all focus on a slightly different theme, be it experience, technical detail or thematic message. In addition to the storyboards there would also be a short clip or two showing the end result in the film. Perhaps as a call out to Kimi no Nawa, the very first thing upon entering the exhibit is an OP. It is essentially using various cuts from Shinkai’s films to the soundtrack Dream Lantern from Kimi no Nawa. It’s great and brings a smile to the face. 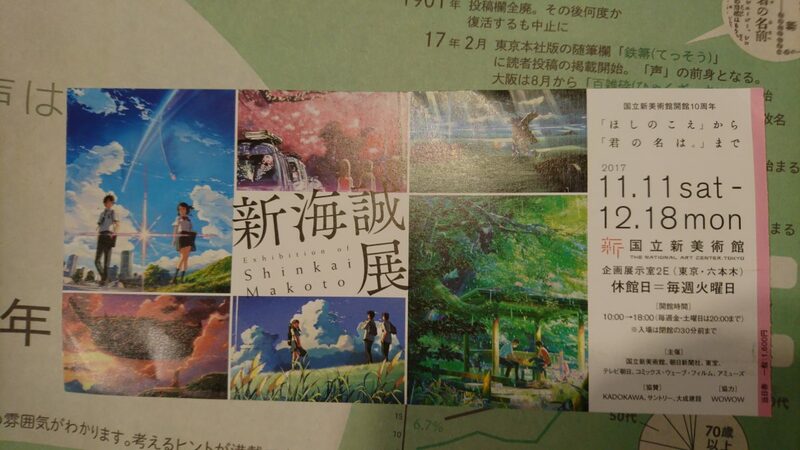 The first section is Hoshi no Koe, Shinkai’s debut film. The section goes into the story that led up to it, how Shinkai created She and Her Cat during his spare time. Hoshi no Koe was a remarkable story, it stunned the world with its beauty, its mix of CG and computer graphics editing, and everything except the music done by his friend Tenmon was done by a single person. It redefined what was considered possible in the industry. Right from the very beginning Shinkai stood out as one of the few who would be seen to have the potential of someday being compared to the great Miyazaki. On display was a recreated work desk when Shinkai worked on the piece by himself, a crowded small desk upon which sat an old PowerMac and a huge drawing tablet. Articles from the time about the film were shown, to help understand how it was received at the time. When Hoshi no Koe was shown in theatre there were people lining up everyday. Even when the last showing had ended there were still people waiting outside, so the theatre decided to put on another showing. Then another, then another, well into the night. Hung from the ceiling was a small scale model of the plane that the protagonist built in the film. This section described Shinkai’s first experience working with a production crew and the struggles he faced. This was a trial by fire for Shinkai. Although the film barely came out and was flawed in may aspects, it laid the foundation for Shinkai’s subsequent work and gave him a core of staff to rely upon and together improve throughout the director’s career. Most notably background art director Danji Takumi who would go on to work on every Shinkai film. It explained Shinkai’s love with clouds, where he fell in love with from looking at the skies in his school years during commute. The mountains surrounding his hometown created a great different variety of clouds and he would sketch them down in his drawing book. The film which most Shinkai fans would come to know the director, as Kamiki admits to be one of them in the narration. He talked of how he fell in love with the pure simple portrayal of love, longing and distances. The film saw incredible success and despite a limited showing was so popular it had an unusually long run in the theatres. The focus apart from the film’s history, was on how the beautiful backgrounds were created. For people unfamiliar with photoshop or digital painting the section would have been greatly informative. The example used to illustrate the background composition was the scene with the parked cars and cherry blossom leaves. The whole background consisted of around 30 layers, the sign card boasted. I’m surprised the whole background only consisted of 30 layers. A common question regarding whether the backgrounds are edited photos or based on photos. This is answered here by showing a series of original real life photo taken during location scouting and their final background art. A fews things can be gathered: the backgrounds are not merely painted over photos, objects in the scenes are shifted and adjusted and the perspective at times changes; Shinkai knows exactly what shot, angle and framing he wants when he goes location scouting, the reference photos aren’t just wide shots to take in the scenery and objects, they are already composed and framed to how the end artwork should look. Here written on the walls, explained Shinkai’s philosophy behind his films. When things get tough, the closest source of comfort is scenery. when feeling no one understands, step back and look at big picture, all people connected to larger world. Even if sad, in the beautiful scenery, you are part of something beautiful. On the wall the cherry blossoms fell. On the TV flashed through scenes from the movie to the theme song of One More Chance, One More Time. Sadness, regret, memories. I was not the only one in the room with wetness in the eyes. The exhibit put significant emphasis on how this film came about. Unsaid that this film was not received well by the fans. After 5cm per second Shinkai went on a world tour to the middle east and London, where he thought about where to take his next film. The answer was Children Chasing Lost Voices where he wanted to return to the roots of Japanese animation and adopted more traditional methods, including designs, palette, and the use of concept visuals which were drawings of a scene, in much more detailed than the usual storyboards, to better convey the fantasy world as envisioned to the team. The technical aspect explained here was the colour setting and brushes. Colour setting was new to me. The colours used for the characters have to change to suit the colour tone of the scene. Each item of the character and their skin tones had to be decided and codified to create a consistent look throughout the film. The different photoshop custom brushes used to paint the backgrounds were shown here. Displayed most prominently was the brush used to draw clouds. 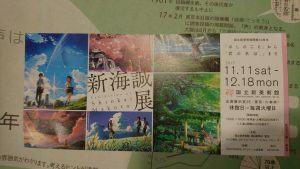 The initial town in the film was based on Shinkai’s hometown. The item on display here was a replica of the crystal radio. The section was pain to point out that the film was not received well and this prompted Shinkai to rethink how to balance the message and story he wanted to tell with what the fan wanted. Cleverly inserted after Lost Voices to break up the tedium of going through film after film, is a section on Shinkai’s life outside of the films. 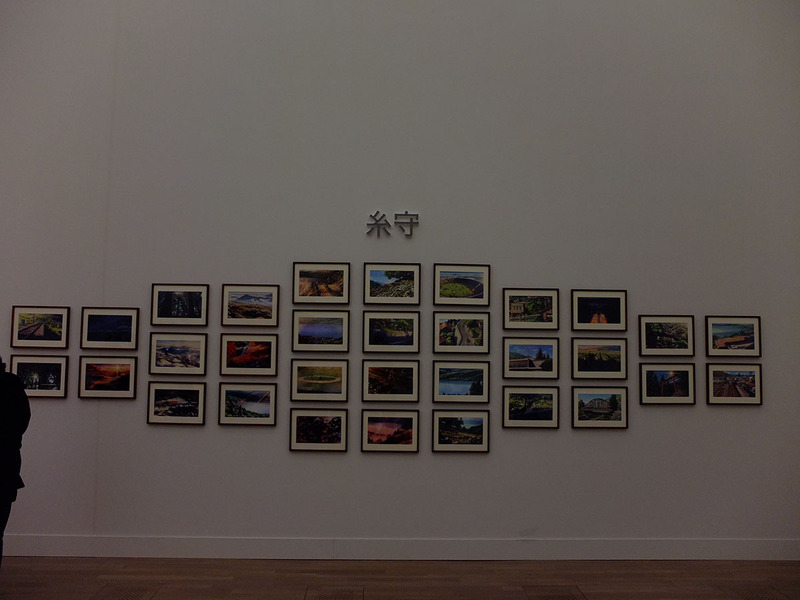 On the wall was a timeline of Shinkai’s life, how his career developed matched to developments in the world. 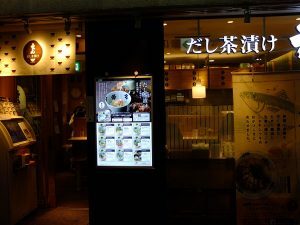 The development of digital technology and how Shinkai was one of the pioneers that took up the medium. The development of the iphone and other major events such as the 311 earthquake. The last point is particularly important given Kimi no Nawa was partly inspired by Shinkai’s visit to Touhoku and his desire to create a more uplifting story for a nation in sorrow. Shinkai did speed skating in primary and archery in high school, both of which featured in his films. Also showcased are some of his works outside of the major films, about his works at Falcom and the OP he created there for the games. The exhibit isn’t shy about mentioning his involvement in EF but they did avoid showing the OP…. which is a shame. Shinkai’s other works also included short features such as the one for NHK about a cat trying to destroy the world, various advertisements (they didn’t show the one for Z-Kai….) and sponsored project like Dareka no Manazashi (Someone’s Gaze). Shinkai’s literature background. Shinkai studied literature as his university major and is very well read. On display are many books which Shinkai drew his inspirations from. Not surprisingly amongst them is Haruki Murakami. There’s a small bit on the common themes that exhibit throughout Shinkai’s works. The railway, the use of lighting to reflect mood, the cats (btw there’s a funny quiz in the audio guide about the name of Shinkai’s cat). It seemed like an odd inclusion as its own section, turns out it’s actually really clever, to be seen later. Did it start to rain? Upon walking into the section, the audio guide springs to life on its and and begins playing the sound of rain. Rain, is the theme of the film and the theme of the section. A veil of transparent threads are hung from above, with ever changing light projections it created an effect of falling raindrops. After the reception of Lost Voices, the guide explains, Shinkai sought to look for the way to create something for the fans without compromising his own visions. The Garden of Words was what he came up with. To create the rain in Garden of Words, Shinkai went out when it rained to study the many effects of rain. From the misty effect to the way rain splashed off stones and trees. In Garden of Words a new technique was also experimented where the outline of characters was coloured as reflection of the surroundings. This created an effect that allowed the characters to blend in with the exquisitely painted background while still pop out of the scene. On display is a replica of the shoes Takao made for Yukino. An actual pair of shoes were custom ordered and created as drawing reference but it was later dismantled for sound effect. It’s interesting to see Shinkai’s storyboard evolve over time. They get much more expressive and the animation instructions ever more detailed, the later may have been a necessity as the team gets larger and harder to communicate face to face. Finally the breakout phenomenon. The section is less like a Shinkai show and more of an Ando and Tanaka show, bringing the design and animation skills of the two to the fore. Despite Tanaka being listed as the character designer in the original trailer, it’s emphasized here that Ando had just as much if not more input into it. While Tanaka provided the base of the designs, it was Ando who did the expression references and most importantly the posture references that contrasted how the characters should move depending on who was the person inside the body. On display was the kumihimo weaving tool. For the technical aspect they tried to show how the flying transition from Tokyo to Itomori was created using layered drawings placed in a 3D space before a 3D model of Itomori lake. 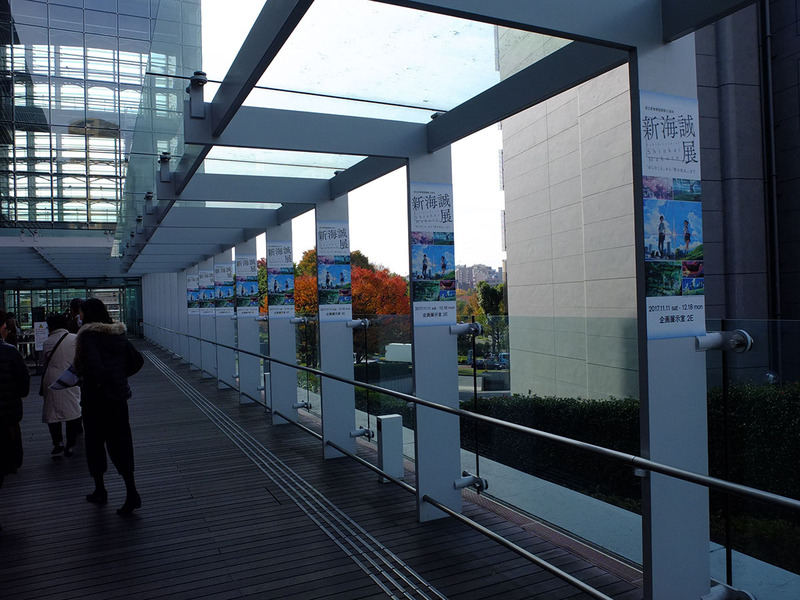 A physical model is on display to illustrate the effect, built using sheets of glass with painted Tokyo buildings and a plastic model (like the model 3D map one often sees in tourist centres). The creation of the beautiful kagura dance is also explained, how Shinkai recorded actual performance of the dance and used it as a direct reference to animate the sequence. The exhibit overall goes out of its way to point out the works of the animators and artists. This isn’t just a Shinkai show. Example of works are also displayed to show off how the animators and artists bring the characters and backgrounds to life. The corrections to keyframes made by the animation directors, the comments they made to Shinkai’s original instructions. This goes for all of the films but is most evident in the Garden of Words and Kimi no Nawa sections. In the Kimi no Nawa section there’s a very amusing series of drawings comparing what the original instruction sketch from Shinkai was, and how Ando the animation director interpreted them. Ando, who famously contradicted Miyazaki several times back when he worked on Spirited Away (and rumoured to be why he later departed the studio), was not shy about correcting Shinkai either. There is one sketch where Mitsuha was moved by emotion had the complete opposite expression of what Shinkai originally sketched. Ando’s take was much better. A side note. Contrary to popular belief Shinkai can draw characters quite well, unless the character sketches in the storyboards were redrawn by others. The OP was an appetizing intro to whet one’s appetite for the exhibition. The ED concludes in fabulous fashion beyond imagination. If the OP is a 8/10 then the ED is a 30/10. Two humongous screens side by side, at times showing a single scene, most of the time showing two scenes from different films containing the same framing, shot, action, message or dialog. I have never, ever, realized how much common elements there are in all his films. The common themes section from before floods to mind and suddenly each one of his individual films melded into mere acts in a single flowing performance. The ED sums up the theme of Shinkai’s word up in a grand, spectacular, awe-inspiring, mind-blowing, realization-dawning MAD style mashup of every film composed in Shinkai’s trademark heart stringing rhythmic cuts with crescendos upon crescendos reaching beyond the beautiful clouds and starry skies. Every cold foreboding cityscape, every brilliant ray of fleeting joy at twilight, every empty landscape that reminded of a better past and uncertain tomorrow, every filled streets that spoke of the loneliness inside, every flash of railway hinting the distance between. Every call, every monologue, every cry for the name of the longing within, every cry in search of happiness that belonged and would have no other, every defiance, every step and leap to action, every burst of tears of wonder; of lost; of hurt; of emotions that binds us in this beautiful world. I like this world I think. The video ends the exhibit with the same words that Shinkai used to end his very first work, She and Her Cat. Exit the exhibit and one reaches the only section where photo taking is allowed. 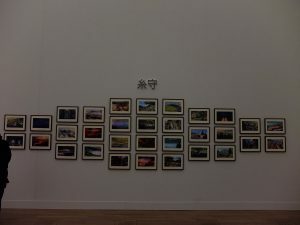 The photo wall scene of the Itomori memorial Taki and Okudera visited is re-created, only this one with colour real-life photos and a cheerful tone. There is also an AR booth where one can get their photo taken and be inserted into a scene from Garden of Words. The goods shop sold many goods limited to the exhibit. T-shirt, postcards, notebooks, clearfiles. Some of the more interesting items included a scarf, the hourglass from the Sparkle MV (the hourglass does not appear in the movie), the kumihimo Mitsuha gave Taki (there are two versions, an plastic imitation and a real kumihimo that required a month wait time), magnets (which I bought) and a exhibition book containing everything that was in the exhibit and various interviews (which I probably should have bought, too tired). I checked my clock and was shocked to find it was 2pm. 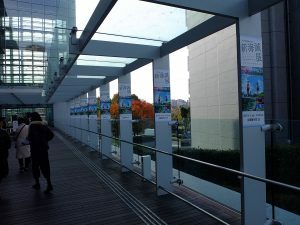 I had spent over 3 hours in the exhibition. 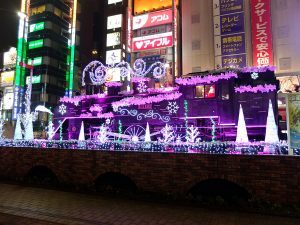 There was no time to go to Shinjuku to see the real life locations that appeared in the movie. I head back to Villa Fountaine to pick up my luggage and head to Super Hotel Shinbashi. The Mita line went from Jimbocho to Onarimon, a little bit south of the Shinbashi area. Super Hotel Shinbashi is in an interesting location, right in the middle of a district and about equal distance of 400-500m from Shinbashi, Shiodome and Onarimon station. The process of checking in was well familiar to me. 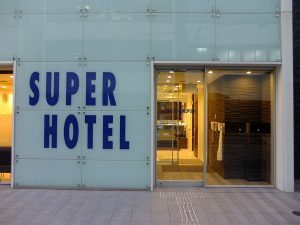 Super Hotel is unique with its use of keypad locks, it removed the need for check outs and reduced staff workloads and in turn, costs. After check in it was time to go through the checklist and get everything that was needed for the next few days ahead. The metro pass, the Hakone pass, the shinkansen ticket and scouting out station layouts and restaurant locations. Most of these involved Shinjuku so I headed there first. First item was the Hakone pass from Odakyu railway since the Odakyu Service Centre closes fairly early at 6pm. 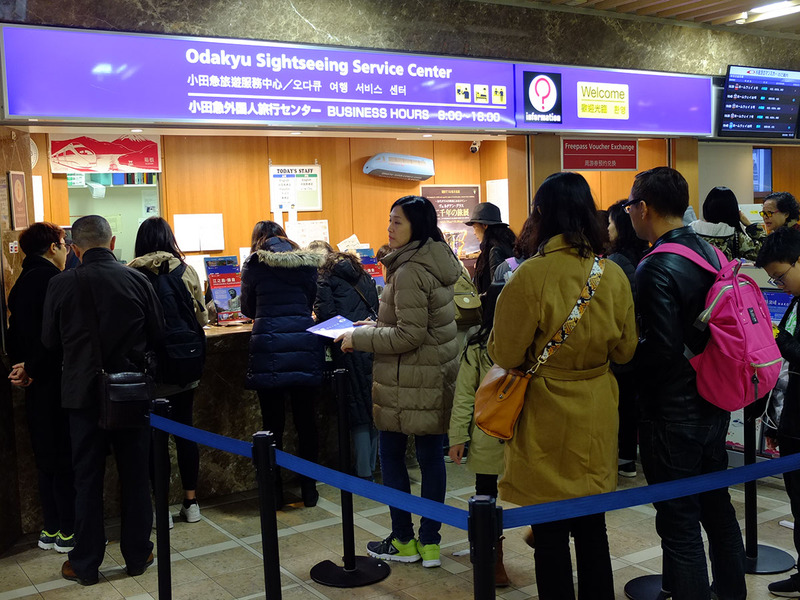 It is still possible to get it from the other general Odakyu tour service at the south exit (this one closes at 7pm) but they don’t have foreign staff there. 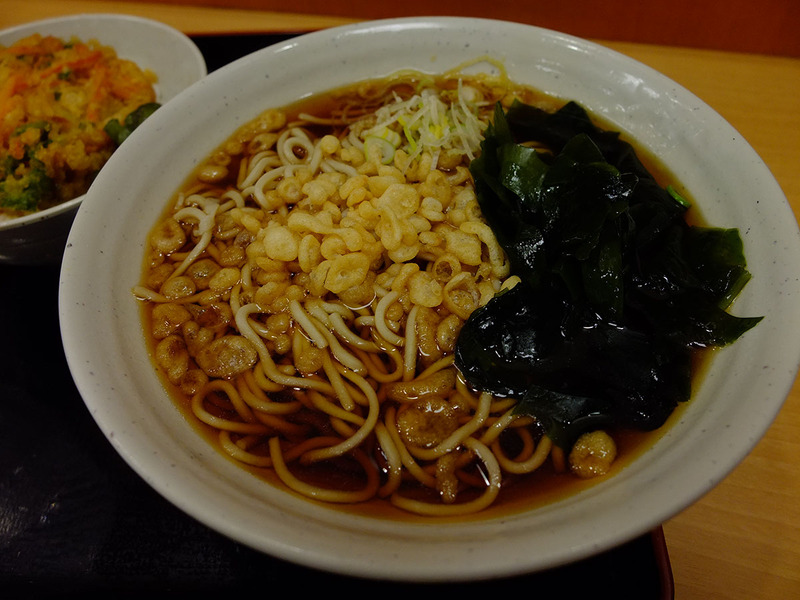 The Hakone pass was sold at the airport, Odakyu Sightseeing Service at Shinjuku or purchased from station ticket machines on the day. The transfers are going to be tight and getting them beforehand was paramount. There was a huge queue and process was slow. They were mostly Taiwanese (saw a lot of Taiwanese on this trip, not many mainland Chinese) and the service desk had several Taiwanese for that purpose. Progress was slow because many people do not necessarily realize that Hakone pass that included travel from Shinjuku to Odawara does not include express charges for one to take the romance cars, so there’s a lot of back and forth explaining, then once that’s explained people had to make a reservation for the romance cars (they are reserved seats only). I only needed the Hakone pass that covered the basic area. I told the staff the date I wanted, emphasized that I wanted the basic version, filled in a form, received the tickets in no time and I was finally on my way. Next was the metro pass. The 72 hour subway ticket that allowed unlimited rides on both Tokyo Metro and Toei lines is limited to foreigners and cost 1500Y. I had estimated that we would use at least as much as the metro pass would cost and anything more was just extra savings. Won’t be much if any, but the convenience was nice. So I headed to the BIC CAMERA just on the west side of Shinjuku station. The man at the info desk was only willing to sell me one of them, to my frustration. The rule was that if one needed more than one pass because one intended to stay in Tokyo for a longer period, one should come back after the first one expires. It was meant to prevent abuse by foreigners reselling it to locals, but I was only asking for 2. They only checked that one had a passport with the tourist visa sticker and did not make any records. I figured that and realized I have to go to the other BIC CAMERA on the east side and get the other one there. Before that though I headed downstairs to confirm the location of the ochazuke (rice soaked with tea) restaurant I considered coming tomorrow. Once that’s been done and I started to head to the east side, I paused and thought I should have something to eat, as I had not even had lunch. There was a soba/udon shop a few shop up from the ochazuke place, similar to the one I had last night. Seemed like a good choice. I ordered the daily special. The tempura vegetable patty was too oily, otherwise taste is okay. Now I got something in the stomach I was feeling better. I got the other metro pass from the other BIC CAMERA (which is really really tiny for some reason, I’m used to them being quite big). Next up is confirming the layout of Shinagawa station. 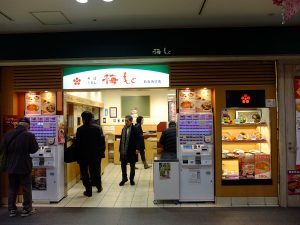 I took the Yamanote line there and paced several times up and down the concourse from the local JR line to the shinkansen ticket gates. About 4 minutes to the gate at a quick walk, then to go through and up the stairs… 5 minutes transfer at a minimum, 8 to be safe. 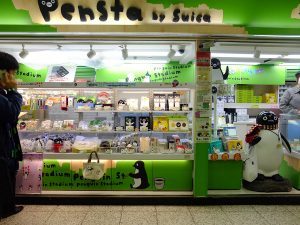 Then Tokyo station to get the shinkansen ticket and also confirm the location of the pensta store (which I forgot to check the other days, this morning when I thought about I was already outside the ticket barrier and pensta happens to be on the inside). By the time I finally checked off the last item on the checklist it was past 7pm. I return to the hotel, did the laundry and went to bed. Tomorrow required a very early start.